Week 13 Premier League matches return this weekend with another round of excitement. Last weekend produced some excellent games if not downright shocking results. Southampton retain their place in second despite being held away to Aston Villa while Chelsea continue to run away with the league. In all of this the biggest shock of the weekend was certainly another Liverpool loss, this time 3-1 at Crystal Palace. Arsenal also managed to lose again, this time in a six-pointer at home to Manchester United. The 2-1 victory for United means they are up into fourth place, level on points but ahead of Newcastle United on goal difference. There aren’t a whole lot of big matches in week 13 but perhaps Sunday morning’s kickoff between Southampton and Manchester City will be the pick of the weekend. A win for the Citizens would see them leap-frog Southampton to take second. Although, Southampton will at least retain a top three spot for the weekend. Tottenham v Everton ending the weekend will be an interesting match as well seeing as they are level on points in tenth and ninth place respectively. Tottenham have not performed well at home, but both teams will be facing off following their European games Thursday. Tottenham have the advantage here since they will be at home while Everton travel to Germany. Liverpool could be in for another shock this weekend despite playing at home. They have been dropping down the table like a stone and find themselves in 12th place, just four points above the bottom three. After finishing last season with a whopping +51 goal difference they are now struggling to score and have a -3 difference. Their midweek Champions League match sees them travel to PFC Ludogorets Razgrad in a must win situation, which leaves them in a difficult spot for the weekend as well. 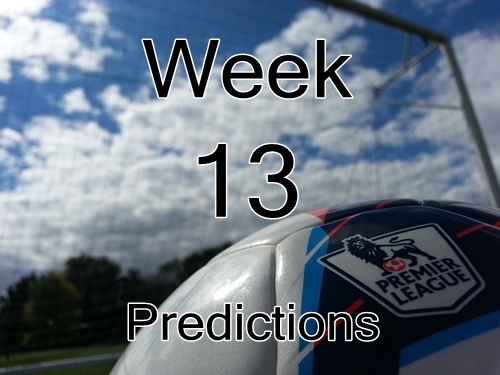 As always, I would love to get your feedback on my predictions for this weekend’s week 13 Premier League games. Come back later in the week for my fantasy picks as well.